The cutest creatures in The Last Jedi have inarguably to be porgs. Ever since we first saw them in the sizzle reel released at D23, porgs began to take Star Wars fandom by storm with their cuteness. When it was announced that a new book would feature them with Chewbacca, it was super-exciting! Apparently, the book tells us, “The porgs have lived in peace and tranquility on the island for many years. Their sanctuary has remained undisturbed by anyone.” That is, until the Millenium Falcon arrives with Rey and Chewbacca. However, since Rey is off training, the porgs are curious about Chewbacca. While curiosity isn’t an issue, per se, hunger does become one. “Wookiees are always hungry. But poor Chewbacca has nothing to eat.” So, unsurprisingly, Chewbacca goes looking for food to no avail. Eventually, however, Chewbacca finds fish in a lake on the island and both Chewbacca and the porgs are happy, as they were also hungry. Ultimately, “Chewie and the porgs enjoy their time together. They laugh, play, and feast.” Of course, as we see in The Last Jedi, Chewbacca has to leave with Rey, but not before taking some porgs along with them. 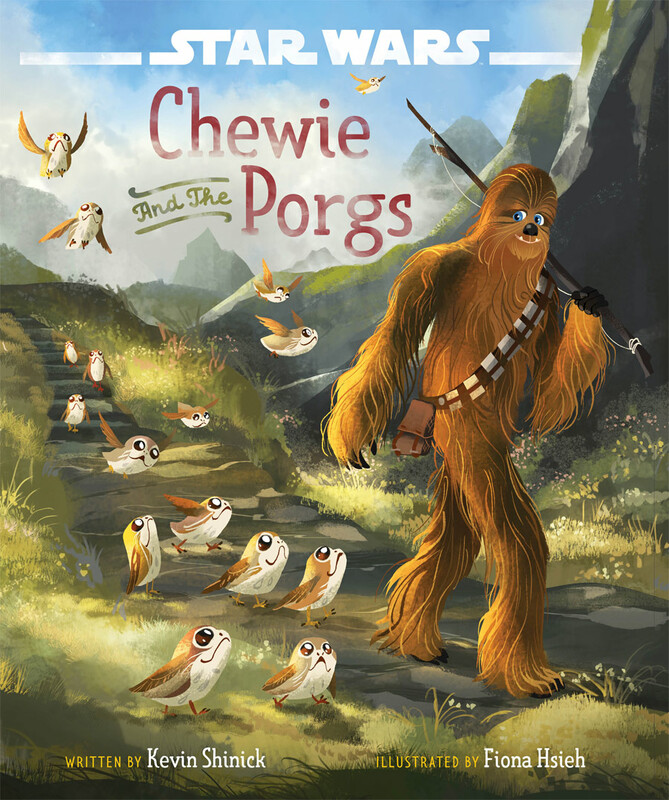 Chewie and the Porgs is undoubtedly a cute book and it’s release is much better timed than the delayed release of BB-8 on the Run, which came out in September. I am still scratching my head why that wasn’t released closer to the release of The Force Awakens. One thing I do not like about this book, however, is the total omission of what we see in The Last Jedi of Chewbacca roasting porgs over an open fire [and presumably having killed them prior to roasting]. I was totally looking forward to how they would have incorporated that scene into this book. I am now baffled as to how it was left out. Yes, I understand this book is geared towards a younger audience, but it still could have had the cute scene in the movie, with Chewbacca rethinking his culinary options. 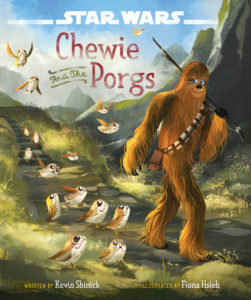 In any event, Chewie and the Porgs is a cute book for kids that shows the development of the relationship between Chewbacca and porgs on Ach-To during the events of The Last Jedi. * There are no page numbers in this book, thus there will be no reference to pagination herein.